This issue is a testament to our readers’ knowledge. Many articles here, on topics such as choosing a photographer, planning for medical support and the benefits of hosting events at off-peak and off-season times, were written on a volunteer basis. They contain great insights and we hope you benefit from them. 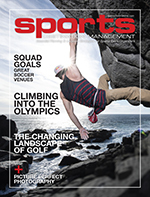 Also in this issue, you’ll find features on golf, soccer, swimming and diving, as well as sport climbing and disc golf. There’s also an excellent “who’s who” feature on our industry. We’re headed into spring and into a new season of sports. This issue provides a great head start. Enjoy! The end of one year and the beginning of another is a time for looking back, taking stock and making resolutions to improve on what you’ve done. Sometimes, though, it's better to just look ahead. The new year brings us closer to the Olympics, the World Games and even the World Cup. This issue will help get you started on 2019 in the best possible way. 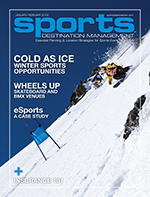 Our articles will jump-start your knowledge of technology, site selection and even give you a better understanding of what it takes to put on an eSports event. There’s much to learn and much to look forward to in 2019. Kick off the year here and now.